Today’s post is not a review since Kaiser Fung’s book is peripheral to the theme of this blog. But I thought I’d call my readers attention to it; it belongs to the genre carved out by Malcolm Gladwell and the Freakonomics duo. By the way, “Freakonomics: The Movie” is being released this fall; the trailer is on YouTube. Numbers Rule Your World: The Hidden Influence of Probability and Statistics on Everything You Do (McGraw-Hill, 2010) is perfect late summer reading for anyone even vaguely interested in statistical thinking—or traffic congestion, or credit scores, or SAT questions. Or state lottery fraud, or lie detector tests, or food recalls. Fung, a professional statistician, also blogs at Junk Charts and Numbers Rule Your World. In this second edition of Chart Your Way to Profits: The Online Trader’s Guide to Technical Analysis with ProphetCharts (Wiley, 2010) Tim Knight accomplishes two tasks admirably: first, he gives a clear description of chart patterns and technical indicators and, second, he explains how to use the ProphetCharts software. In the good old days ProphetCharts provided free online charts. Then about five years ago INVESTools purchased Knight’s company (a sad day for me as my best source for futures data disappeared). Now, however, as a result of a TD Ameritrade buying binge, the software is available to clients of Think or Swim (so I have it once again) as well as INVESTools. The software is powerful. I particularly appreciate its range of available charting time frequencies, from one minute to a month, its user-friendly drawing tools, and its ratio chart option. Investors and traders who have read innumerable books on charting and technical analysis and who don’t use ProphetCharts might be tempted to move on to the next new thing. But they would miss the many helpful pointers that Knight gives in this more than 500-page book. That he devotes 69 pages to the head and shoulders pattern gives an idea of the depth of his analysis. I can recommend this book without qualification to those who are unseasoned in technical analysis and charting and to those ProphetCharts users longing for much more than a software manual. I also suggest that experienced technical traders take a look. A brief read recommended by Barron's Alan Abelson: "The Marginalizing of the Individual Investor: The inside story of flash crashes, systemic risk, and the demise of value investing" by Harald Malmgren and Mark Stys. It is yet another look at high-frequency trading. Don’t judge a book by its title. John B. Abbink’s Alternative Assets and Strategic Allocation: Rethinking the Institutional Approach (Wiley, 2010) is a fascinating work. It’s packed with well-reasoned insights about a range of markets and strategies and written with clarity, precision, and wit. Anyone who trades for his own account, runs a fund, or manages an institutional portfolio should put aside a day to read this book. It will be a day well spent. Abbink contends that there are just three investment strategies that underlie all approaches to investing: directional strategies, cash flow strategies, and arbitrage strategies. They can be pursued individually or, more frequently, in combination. Returns from these three strategies can be enhanced through the techniques of leverage, hedging, tactical allocation, investor activism, accepting liquidity risk, or trading volatility. Abbink analyzes a range of investment styles: long/short equity, direct lending, merger arbitrage, high-frequency trading, holding private assets for their cash flows, fixed-income arbitrage, and event-driven investment. He then moves on to position management and portfolio construction. That’s the book in bald outline. Since I obviously cannot condense over 500 pages into a few paragraphs, I’m going to let Abbink speak on his own behalf. To begin, here are two passages, the first dealing with hedging and the second with opportunity cost. Abbink’s book brings a fresh perspective to topics often relegated to academic papers, making them accessible to investors, both individual and institutional. It’s one of the most thought-provoking books I’ve read in quite a while. Today I’m back to Scott Berkun’s The Myths of Innovation. If his chapter on creative thinking hacks is “a high-speed, condensed version of a course [he] taught at the University of Washington,” this post is the warp-speed, ultra condensed version. So how do we go about becoming creative? Stop reading and start doing. “The word create is a verb. Be active. … If all your attempts at being creative consist of passive consuming, no matter how brilliant what you consume is, you’ll always be a consumer, not a creator.” (pp. 173-74) Yes, I hear you! That's the gist of one of the most e-mailed articles in today's New York Times: "Digital Devices Deprive Brain of Needed Downtime." Isn't it amusing that everyone, including me, is using digital devices to tell others why they shouldn't use them so much? Isbitts reworks the classic 60/40 approach to investing. The old mantra was to put 60 percent of your money in stocks and 40 percent in bonds. Isbitts’ take is tactical—try to make at least 6 percent for every 10 percent move up in the market and try to limit losses to 4 percent for every 10 percent move down in the market. Easier said than done, as everyone who manages money would undoubtedly attest. It’s one thing to write about cycles: up, down, and transition. It’s another thing entirely to offer effective guidelines to identify these market phases in real time. Although Isbitts and his team engage in cycle analysis, he circumvents the problem of timing, in part at least, by appealing to asset allocation. These strategies can be pursued individually. But, taken concurrently, they offer the investor the ability to hedge his position during “countertrend” declines in stock prices while holding onto his core long-term positions. As should be apparent, this three-pronged approach to asset allocation is not designed for the investor with a small account. Isbitts’ background is in wealth management. The final part of the book deals with evaluating performance. Benchmark envy, he writes, “is one of the most destructive forces to investors.” (p. 177) Benchmarks should be used for comparison over “long stretches of time—5 to 10 years,” not as a short-term measure of whether an investment is working out. Isbitts describes some useful ways to keep score: capture ratios, standard deviation, rolling returns, and R-squared. Here I’ll confine myself to only two: capture ratios and rolling returns. The capture ratio “is a statistic that tells you how much of the market’s move you have experienced.” (p. 180) If your portfolio grows by 8% during a 10% up move in the market, you would have a 0.80 up capture ratio. If the market goes down 10% and your portfolio falls by 6%, you would have a down capture ratio of 0.60. If in the same bear market scenario your portfolio has a 2% gain, your down capture ratio is -0.20. The capture ratio is a useful statistic because it shows how various portfolios have performed historically and how they might react to future market conditions. 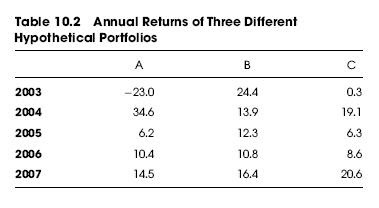 As you might suspect, these are not three different portfolios. A is the return of the S&P 500 from February 2002 to January 2007; B is the index’s return from October 2002 to September 2007; C is its return from July 2002 to June 2007. This is a thoughtful book on portfolio construction, one which financial advisors would do well to read. The individual investor might not be able to implement all of Isbitts’ suggestions, but the principles set forth in this book should enable him to both reassess the potential robustness of his portfolio and make some improvements to his mix. 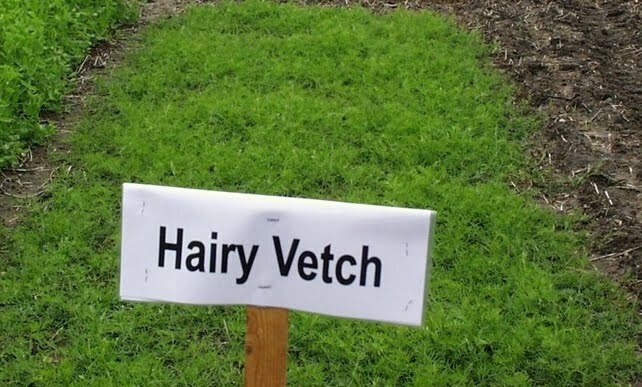 Over the course of the next week or two, as “summer” winds down and I begin sowing hairy vetch and oats in my vegetable beds in anticipation of a more bountiful harvest next year, I’ll offer a mix of book reviews and some brief posts based on Scott Berkun’s The Myths of Innovation (rev. ed., O’Reilly, 2010). Today I’ll explore the applicability of the myth of methodology to trading. The myth of methodology is “the belief that a playbook exists for innovation [which] removes risk from the process of finding new ideas.” (p. 37) Nonsense, Berkun writes. “There is no way to avoid all risks when doing new things. … Even the scientific method, the process behind the ubiquitous ‘rocket science,' doesn't promise success—consider the Apollo 13 mission or the Challenger space shuttle disaster. And methods created by gurus or famous executives fall well short of predictive. Of course, the trader is not an innovator in the course of his daily business; he doesn’t try something new each time he puts on a trade—or at least one hopes he doesn’t. So the myth of methodology has to be rejiggered a bit to fit the trading environment. We might rewrite it somewhat along the following lines: A trading playbook exists (or a set of trading playbooks exist) that will consistently maximize profit and minimize risk. The problem is that we know that the rules of science don’t apply to trading. We can’t faithfully follow a trading methodology and expect to achieve the same results repeatedly. We can’t even expect the same results X% of the time. The market is not a controlled environment like a laboratory. As a result, no matter how robust a methodology seems, no matter how intuitively obvious it may appear, we know that it will fail. We just don’t know whether it will fail an acceptable percentage of the time or whether it will blow up completely. And, yes, odds are that the trading methodology will blow up, though we don’t know when (it may work for weeks or years) or what will provide the catalyst. Moreover, whether the trader follows a plan that provides room for discretion or trades mechanically, he isn’t like the debauched, robotic lab instructor. Unless he is trading on autopilot, it may make a great deal of difference to his potential success how late he was out or how many bars he visited the night before. First we read that Stanley Druckenmiller is shutting down his hedge fund, worn down by stress. In the last three years his Duquesne Capital Management couldn't match the 30% annual returns it had seen since 1986. Though it has never had a losing year, it is down 5% this year. And then we read that investors have fallen out of love with the quants and that the combined assets of quant funds specializing in U.S. stocks have fallen 61%. Money is going to funds managed "by human beings, rather than computers." Presumably those same kinds of human beings who can be worn down by stress. John Baschab and Jon Piot have added to the growing literature on endowment fund investing in Outperform: Inside the Investment Strategy of Billion Dollar Endowments (Wiley, 2010). The bulk of the book is taken up with interviews, first with fund managers from both public and private universities (Ohio State, University of Oklahoma, University of Texas, Cornell, Case Western Reserve, Emory, George Washington, Rice, Texas Christian, and Tulane) and then with advisors and managers. Although the authors, most likely at the behest of the publisher, try to find lessons from endowment fund investing strategies for the individual investor, the book struggles a bit on this front. The managers whom they interview are clearly more comfortable talking about what they do than about how individual investors might be able to profit from imitating them. Indeed, the authors themselves admit that “the number and magnitude of differences between the situations of an individual and an endowment make it difficult to mimic endowments closely.” (pp. 281-82) Among the main differences they identified are: access, expertise, bandwidth, taxes, time horizon, liquidity requirements, fees, and vintage year diversification. Second, although we normally think of the endowment fund model in terms of asset class diversification, we should look at diversification more broadly. It is important to diversify sources of return, sources of alpha, and risk as well as to reduce volatility in normal environments. (p. 100) This is sound advice not only for endowment fund managers but for individual investors. In today’s post I will share some of Wyckoff’s pointers on how to invest and trade. To begin with, he was an ardent advocate of studying and practicing prior to committing money to the market. He himself only began to invest after eight years of study, and he started to trade six years after that. He considered himself a speculator, where speculation “involves the use of intelligent foresight.” (p. 17) The theme of intelligence permeates Wyckoff’s text. Take chartists, for instance. Back when he was still a clerk, keeping charts was “looked upon as making one fit for the squirrels. In and out of many brokerage offices there hustled wild-eyed individuals with charts under their arms, who would hold forth at length on double tops and bottoms…. Yet none of them seemed to have much money.” (pp. 28-29) Their problem was not that they looked at charts. They were unsuccessful “because they followed a strict set of rules and did not use much intelligence. It seems that the charts told them exactly what to do!” (p. 29) With that putdown, he summarily dismissed mechanical trading. Wyckoff’s modus operandi was to have a small trading account (“not over five or ten per cent. of my loose capital”) and invest its profits into income-paying securities with the potential to appreciate in value. Wyckoff justified the size of his trading account psychologically. “There is a much greater satisfaction in operating with a small amount of money for various reasons: It makes you more careful, because, having set yourself to the task of realizing a large profit on a limited amount of operating capital, you plan your moves shrewdly and do not take risks such as you would if operating with more money.” (pp. 42-43) And then there’s the emotional high of seeing outsized returns on a percentage basis. Over the weekend I read Sebastian Mallaby’s More Money Than God: Hedge Funds and the Making of a New Elite (Penguin Press, 2010). I admit that I’m addicted to books on top hedge fund managers; I’m fascinated by how these gurus think—and act. Although Mallaby’s book often retraces some well-trodden ground, the columnist and former editorial board member at the Washington Post writes so compellingly that I was never tempted to skim. Since this book came out in June and has been reviewed extensively, in today’s post I’ll focus exclusively on the hedge fund manager and team I will never be able to emulate sitting at my Dell Precision workstation but whose consistently high returns remain a goal—James Simons and the mathematicians and scientists who work at Renaissance Technologies. Between the end of 1989 and 2006 Medallion, its flagship fund, returned an average of 39% per year. It took about a decade for Renaissance to begin capitalizing on ghost hunting. Henry Laufer, a mathematician at Stony Brook, “spotted patterns in the way that markets move right after an event perturbs them. … It was not that a commodity would jigger in the same way following every piece of news: That would have been too obvious. But if you scrutinized thousands of reactions to thousands of events, certain sequences emerged in slightly more than half of all the observations.” (pp. 287-88) Renaissance began to replace its underperforming trend-following models with short-term statistically driven trading, and the profits became robust. Zack Miller has written a book that with any luck will be out of date in a couple of years. But never mind. In the meantime Tradestream Your Way to Profits: Building a Killer Portfolio in the Age of Social Media (Wiley, 2010) takes the reader on a fascinating tour of Internet resources that offer the individual investor or trader opportunities to beef up his returns. The tour is organized around eight approaches to ferreting out investment ideas: following stock analyst blogs, piggybacking the pros, joining expert communities, crowdsourcing, screening, tracking inside moves, keeping an ear open to rumors, and doing co-lateral research. Today’s investors don’t need to pay big bucks to “subcontractors” for actionable ideas, which is not to say that everything online is free. But the trick is to separate the wheat from the chaff, where cost provides absolutely no clue about value. There’s an inordinate amount of material on trading and investing available online, much of it near worthless, some of it outright fraudulent. Some costs thousands, some is free. How does the individual investor sort through all the noise to get the kind of input that enabled Jones to produce outsized returns? There are two basic approaches, probably best encapsulated in Thomas Paine’s famous dictum “lead, follow, or get out of the way.” (No, Lee Iacocca wasn’t the author.) First, get information so you can lead; second, follow the picks of gurus. The second, of course, is ever so much easier but not thereby to be decried. Let’s take the strategy of piggybacking the pros, which has a proven track record. Where can the individual investor access information on what the pros are doing? AlphaClone is the obvious choice. Or if you prefer to join an expert community there is a range of possibilities, from kaChing and MarketGuru to Covestor and SumZero. Miller highlights a handful of sites where everything is either vetted or capable of being vetted. He touts Seeking Alpha, with which he was involved early in its development. Wikinvest is another valuable source, dependent on collaborative activity. Miller’s book is something of a travel guide for the investor. It’s written exceedingly well, as one expects of a travel guide. It explains an investor’s options: he can go on a guided tour, join a self-directed group, or strike out on his own. And it provides resources that the investor can tap into depending on which option he chooses. All in all, I thoroughly enjoyed the book and consider it a must-read for anyone who runs his own money and isn’t yet generating alpha. Miller, by the way, writes the blog New Rules of Investing which is worth a look. The folks who bring us Active Trader (by subscription only), Currency Trader, and Futures & Options Trader have added another free magazine to their lineup: Managed Futures Today. It is currently being published on a quarterly basis. So far two issues have been published, one in May and the second covering August through October. For those of us who dislike the software that tries to recreate the experience of reading a print magazine a .pdf version is available. I found the audio of Tushar Chande’s 1998 workshop, How to Build Both a Trading System and a System for Trading, some time ago on the web, I no longer remember where. I’m sure that anyone who tries hard enough can retrace my footsteps. Seminar participants also received a fairly lengthy handout, which I have as well. For those who don’t feel like searching, here are a few bullet points from the handout. There’s nothing revolutionary among them, but they may tickle some trader’s little grey cells. First, a simple 3-bar consolidation pattern. Use the high and low of two days ago as reference (the H-L reference window). Yesterday’s and today’s close must be inside the reference window. Buy or sell on a breakout above or below the reference window. Chande also suggests a similarly constructed 5-bar consolidation pattern. Here the long-only system is: if the last four closes are within the shadow of the previous bar, then buy one contract at the most recent three-day high on a stop. Place a stop at yesterday’s low. Exits can be based on an anticipated or desired price behavior, length of trade, smoothness of equity curve, or initial money management risk. Use an exit strategy that is consistent with your style. Common types of exits are time-based, trailing stop, profit target, volatility, and combination. To evaluate exits generate 50 or more signals and look at the smoothness of the equity curve. Check percent profitable and profit factor across more than ten markets and over a “long” time. Finally, benchmark your system to measure its added value. Of course, there are many ways to benchmark. One can benchmark by style—trend following, anti-trend, breakout, short-term, pattern based. One can benchmark apples to apples by using an identical test set (markets, time period, leverage, starting capita). One can benchmark to an index, such as the S&P 500 or compare to a buy-and-hold strategy. And then you have to define why your system is better. Does it have higher profits, lower drawdowns, a higher Sharpe ratio? I suspect that there are only a handful of people in the world who are capable of fully understanding and appreciating Elie Ayache’s The Blank Swan: The End of Probability (Wiley, 2010). I admit up front that I am not one of them. Yes, I was trained as a philosopher and know more than the average bloke about option trading. If it weren’t summer I could even have both props recommended by Paul Wilmott for reading this book—a log fire and a large Scotch, “or probably several.” The problem is that the book takes the reader on an adventure down an often unnavigable rabbit hole and is written in language that, though clear on the surface, keeps wrapping around on itself. It is series of literary Möbius strips. The philosophical underpinning for Ayache’s work comes from Quentin Meillassoux’s acclaimed effort to rescue metaphysics from dogmatic metaphysicians and the material world from the post-Kantian correlationists. (Meillassoux’s essay After Finitude: An Essay on the Necessity of Contingency was translated into English in 2008.) But Ayache radicalizes and some might argue trivializes Meillassoux’s philosophy: “…speculation shall from now on become absolutely nonmetaphysical, and by this I mean that it won’t even be about the physical world and its laws and that it won’t be concerned with possibilities and expectations any more. … my speculation will be absolute speculation, that is to say, speculation in the sense of financial markets.” (p. 162) He views derivative writing as an alternative to metaphysics. This strikes me as absolute hubris. I am very sympathetic to Ayache’s goal of wresting the trading world from the shackles of probability. I’m just not convinced that the only way to accomplish this is by transforming the presumably mundane action of writing an option into such philosophically fertile ground. 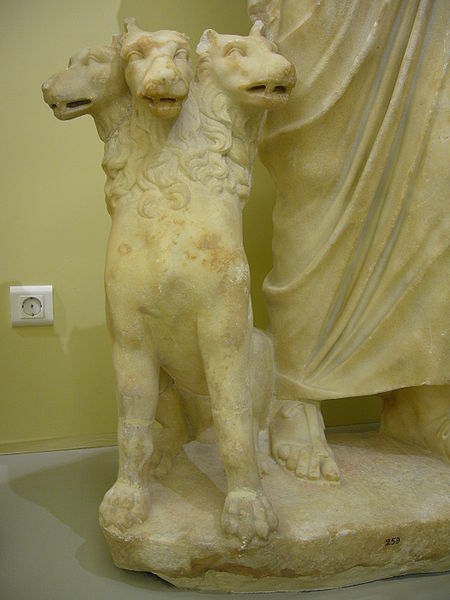 Assume that Cerberus was a good dog who kept traders away from financial Hades (and I figure that this Roman sculpture of the single-toothed Cerberus is probably as close as it comes to benign in art history) as opposed to the dog who prevented those who crossed the river Styx from ever escaping. This three-headed dog might then be an appropriate icon for the team that put together DV Indicators XL: David Varadi (indicator writer), Jeff Pietsch (programmer), and Corey Rittenhouse (designer). We know them from the blogs CSS Analytics, ETF Prophet (formerly from Market Rewind), and Catallactic Analysis. This is one nifty piece of Excel-based software, though I do suggest having a backup copy because in the course of racing through its features I managed to corrupt mine, though it was remedied quickly enough. I never cease to be amazed at what talented programmers can do with Excel; I’m mighty envious of their skills. The basic edition comes with eleven indicators intended for either trending or mean reversion environments and for short, intermediate, or long-term holding periods. (The average holding period for SPY trades ranged from 2.26 days to 28.21 days.) You can backtest them over a ten-year period on whatever stock or ETF your heart desires, choosing either to go both long and short or to trade from only one side of the market. You can also analyze current conditions with fifteen indicators that combine to give three time frame signals and an overall advisor signal. A telling exercise, by the way, for those who still believe in the random walk theory is to backtest a mean-reverting indicator as if it were a trending indicator. I tried this on a variety of stocks, both low beta and high beta, and, believe me, the equity curve isn’t pretty! The CME Group Risk Management Handbook: Products and Applications by John W. Labuszewski, John E. Nyhoff, Richard Co and Paul E. Peterson (Wiley, 2010) is, as its title suggests, a reference book with a marketing edge. After chapters on futures markets fundamentals, order entry and execution methodologies, and the role of the clearinghouse, we move on to the main body of the book. Here the authors describe the principal CME Group futures products and show how they can be used as integral parts of risk management strategies. A brief account of fundamental market indicators and a longer technical analysis primer follow. Finally, we are introduced to options on futures and various option strategies traders can use to hedge their positions. The book, 606 pages in length, is far more than a rehash of material available on the CME Group site. For instance, take something as seemingly straightforward as hedging a diversified stock portfolio with stock index futures. How do you calculate the hedge ratio? You divide the monetary value of the stock portfolio by the fair value of, say, one E-mini S&P 500 futures contract and multiply that by the weighted beta of the portfolio. The answer will be the number of futures contracts you need to sell to hedge the portfolio. Or assume a less radical hedge where an investor, in anticipation of a near-term market advance, wants to keep his portfolio’s size constant but increase its beta from 1.05 to 1.20. In that case, the formula would be (value of the stock portfolio / value of the index) x (1.20 – 1.05). 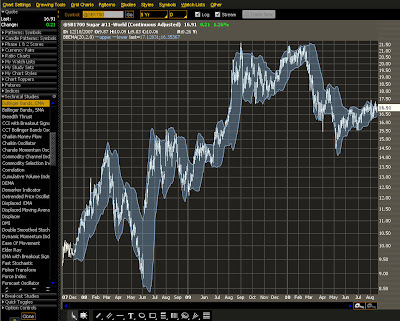 The hedge ratio for currencies is even simpler: the value of risk exposure / futures contract size. For example, a U.S. company whose financial statements are denominated in U.S. dollars agrees to sell goods for future delivery and a future payment of €50,000,000. Exposed to the risk of a declining euro versus the U.S. dollar, the company might decide to hedge its risk exposure by selling EuroFX futures worth €125,000 per contract. It would, using this simple formula, have to sell 400 EuroFX futures contracts. An outright hedge is only one strategy outlined in this book, though it receives the most attention. We are introduced, for example, to calendar spreads in gold futures, to trading the curve with treasury futures, and to intermarket currency spreads. Anyone who has experience trading futures should expect to find some of the material in this book very familiar, other material somewhat familiar, and the remainder refreshingly new. I, for instance, learned a great deal from the chapters on Eurodollar futures and Treasury futures because I have had limited exposure to them, much less so from the chapter on stock index futures, and virtually nothing from the sections on technical analysis and options. Since every trader is on a different learning curve and few traders are eclectic in their choice of instruments, I’m certain that there’s valuable material for everyone in this handbook. Whether you’re interested in repo financing or soybeans, esoteric weather products or the TED spread, you’ll find a clear, thorough discussion. An interesting piece by Nick Gogerty yesterday on the flash crash. And an older post by Aswath Damodaran entitled What if nothing is risk free? Since the ETF world has been changing so rapidly, a second edition of The Exchange-Traded Funds Manual (Wiley, 2010) was definitely in order. Gary L. Gastineau provides a comprehensive analysis of ETFs with enough actionable tips to make it not only a reference book but also a trading guidebook. Gastineau suggests that silent (nontransparent) indexes can help mitigate the transaction costs associated with transparent index funds. Admittedly, the SEC requires transparency, so a silent index fund couldn’t be marketed as an index fund at all; it would have to be called something else. What would a silent index look like? It “can be based on the same kinds of rules as a rules-based benchmark index—but the specific silent index rules should not be published. The rules have to be sufficiently obscure to protect the fund from speculators attempting to front-run trades by the fund portfolio manager. The rebalancing date(s) of the fund and the capitalization range might be randomized from year to year. Of course, the rebalancing dates and capitalization range would not be disclosed.” (p. 125) The fund manager of whatever the silent index fund is called would also be able to engage in full-function active management. Naturally, Gastineau develops this idea in more depth, analyzing some of its drawbacks as well as its strengths. I have no space to follow it any further, but I found it an imaginative, contrarian response to the problem of transparency in index funds. All in all, The Exchange-Traded Funds Manual should be required reading for all financial advisors and fund managers. The individual investor should also find enough meat in it to make it a worthwhile read. The inspiration for this post comes from a book by Patrick Forsyth, How to Motivate People (Kogan Page, 2000, 2010), written for business managers. Considering that the independent trader wears two hats--he is both a manager and that manager’s one-person execution team, I thought it might be instructive to look at the topic of motivation from the vantage point of the manager. Forsyth defines the key management tasks as planning, recruitment, organizing, training, motivation, and control. The independent trader in his role as manager obviously doesn’t have to worry about recruitment; for better or worse he’s stuck with himself. But he has to carry out all the other tasks. And motivation is one of his key responsibilities. How does he keep himself motivated? Forsyth turns to the classic work of Frederick Herzberg and his two-factor theory of job satisfaction. Herzberg divided conditions that affect performance into two categories: “hygiene” factors and motivator factors. Hygiene factors are required to avoid job dissatisfaction; motivator factors are necessary for job satisfaction. Among hygiene factors are working conditions, status, and perhaps most surprisingly salary. Motivators are achievement, recognition, the work itself, responsibility, advancement, and growth. If Herzberg’s theory is valid, what are some takeaways for you, the independent trader? First, the amount of money you make trading is not itself a motivator, although you have to achieve an acceptable income level to avoid job dissatisfaction. Second, you are unlikely to receive recognition for your trading prowess from the outside world because, quite frankly, nobody wants to hear about your triumphs. But you as manager can recognize the achievements of you the trader, perhaps with some rewards along the way for outstanding performance—something between an employee of the month plaque and a down payment on a Rolls. Third, you as manager must keep encouraging you the trader to keep growing and advancing as a trader, perhaps even to take on new responsibilities. For instance, if you’re doing a good job trading one instrument, perhaps you might expand to another. I’m sure you can come up with other ways that your managerial side can motivate your employee side; these are just some quick thoughts. In the final analysis, of course, if you don’t find the work itself a motivating factor you’re sunk as a trader. Unlike flipping hamburgers or working on an assembly line, trading is a “love it or leave it” kind of job. The Handbook of Trading: Strategies for Navigating and Profiting from Currency, Bond, and Stock Markets edited by Greg N. Gregoriou (McGraw-Hill, 2010) is a collection of twenty-nine papers written primarily by academics. The contributors span the globe and use data from a range of markets. The topics covered include momentum trading, technical trading, ETFs, algo trading, trading volume, and trader psychology. In today’s post I’ll share a few insights from this book. First, a topic that many books gloss over—the costs and benefits of limit order trading. Here I am drawing from the paper “Order Placement Strategies in Different Market Structures” by Giovanni Petrella. The book’s official website, by the way, has over 300 PowerPoint slides related to the articles available for download.